Let's make this short. The novelty of #rpgaday2015 has faded off and now we come to the favorite fantasy, horror, sci-fi, whatever game. I'll post this one as a separate entry, but I'll bulk the other ones. 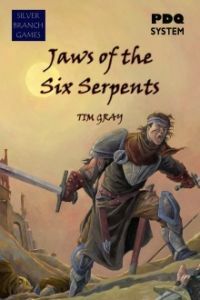 This one goes equally to Barbarians of Lemuria German edition (still haven't read the new Mythic edition but am slightly put off by the replacement of Brawl by Initiative) and PDQ/Jaws of the Six Serpents. Why? Both games are sword-and-sorcery, a genre which I like a lot. It's a bit more gritty and magic is mostly corrupt and dangerous, a welcome exception from high fantasy. BoL and JotSS are both excellent rulesets for heroic characters. BoL has a career/lifepath-system which is fun. Also, the Boons and Flaws add the "Advantage/Disadvantage"-mechanic (waaayyy earlier than the popular D&D 5e). The German edition looks gorgeous with great artwork (ignore the cover, the interior stuff is hawt!) and good layout. PDQ/JotSS are open-ended, narrative and a little bit more freeform. Tim Gray expands the system in JotSS to better fit the genre. For me, PDQ (the original PDQ, not PDQ#) is the better Fate: it has aspects but isn't immersive-hostile like the Fate compels etc. Furthermore, both games are very versatile and can be easily adapted to other genres. I totally recommend both games, they are very good. PS: I totally forgot Far Away Land (aff) which is also a worthy competitor: an old school (unique, no D&D retro clone) fantasy heartbreaker in Adventure-Time-style. This is great, too, check out this review. Also, Blood of Pangea, another rules-lite old school Sword & Sorcery entry. I also like this a lot, it's even more lightweight than the others.